We know the Bible is important, but many of us struggle with it. We're not biblical experts-though we may have started enough reading plans to be really familiar with Genesis. If we're honest, the Bible often intimidates us, confuses us, and reading it doesn't always thrill us. And yet, the Bible is where God reveals his loving character and incredible plan of redemption. 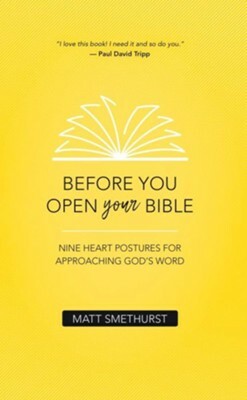 In a practical and engaging manner, Matt Smethurst-managing editor of The Gospel Coalition-presents nine heart postures that will prepare you to unpack all that's awaiting you in God's Word. Although there are many great resources on how to read and study Scripture, hardly any focus exclusively on how to approach it in the first place. That's what Smethurst provides in this unique "prelude" to opening your Bible. For without the right heart postures, we're not yet ready to start reading. I'm the author/artist and I want to review Before You Open Your Bible: Nine Heart Postures For Approaching God's Word.